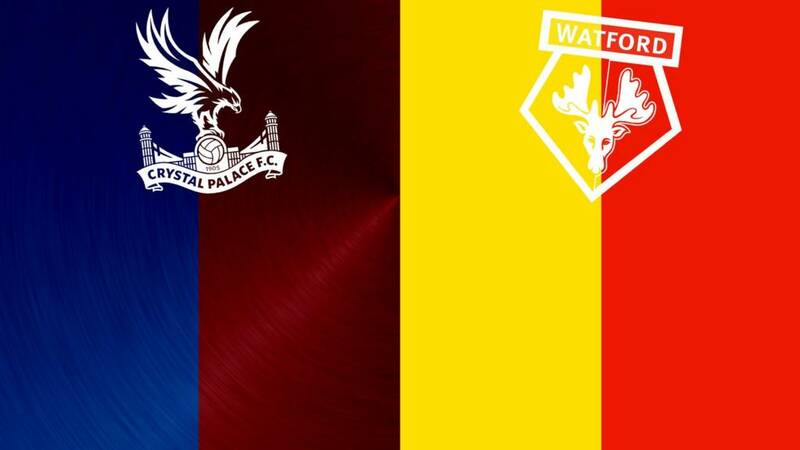 Palace XI: Hennessey; Ward, Dann, Delaney, Souare; Zaha, Jedinak (c), Cabaye, Mutch; Wickham, Adebayor. Watford XI: Gomes (GK); Nyom, Prödl, Cathcart, Ake; Behrami, Watson, Capoue; Amrabat, Deeney (c); Ighalo. That's it - a good afternoon for Watford, but It's a worrying run of form for Palace. Yohan Cabaye hits the base of the left post with a volley from just outside the "D". Deeney is leading the way to try to secure the points for his side, with Watford still on the front foot. Ben Watson's cross deflected off a Palace head and dropped perfectly for Deeney, who controlled it off his thigh before drilling the ball past Wayne Hennessy. Lee Chung-yong drills in a low free kick from the right straight at Gomes, who pushes the shot away to safety. Lee Chung-yong dances into the area from the right but Mario Suarez robs him. Within seconds Suarez is booked - the first of the day - for hauling back Delaney. Nathan Ake goes close, driving a shot on target that Wayne Hennessey has to push away. Heurelho Gomes claws away another towering header from Adebayor, but the referee thinks Campbell was blocking the Watford keeper illegally and blows for a free kick. Jordon Mutch is off for Fraizer Campbell for Palace. It's gone very quiet on the goal-mouth action front - chances have been few and far between so far but you get the impression this could still explode into life. Emmanuel Adebayor sticks out a telescopic leg to rob Allan Nyom, but his pass towards Mile Jedinak is behind his captain and the attack breaks down. Palace''s Scott Dann needs a bit of treatment after clashing with Troy Deeney, eventually returning to action. Watford mount a rare attack but it ends when Allan Nyom's cross cannot beat the first man Pape Souare. Watford's Almen Abdi replaces Nordin Aamrabet. Wilfried Zaha rampages down the left again, seeing his first cross blocked by Craig Cathcart while his next finds Emmanuel Adebayor, who this time cannot get a shot in on target. Wilfried Zaha's switch to the left wing has made a real difference this half, and his latest foray ends in a low cross that Emmanuel Adebayor trips over but still manages to squeeze it goalwards. Seconds later, Jordon Mutch lets fly from range and forces Heurelho Gomes into a decent save to his left.